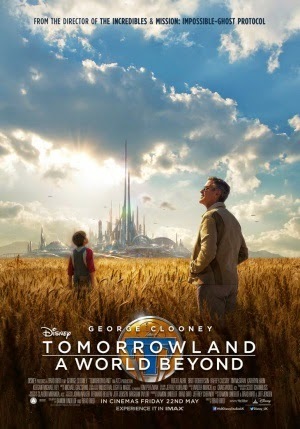 Tomorrowland: A World Beyond is hard to summarise, as it's narrative has been seldom explored by the marketing campaign, leaving it an exciting mystery to all those waiting to witness it. The central premise that initially clouds all the rich details revolves around Casey Newton (Britt Robertson), a tech whiz repeatedly sabotaging the destruction of a NASA launch pad to oppose mankind's decline into pessimism and loss. Upon finding a mysterious pin with unknown markings, she is brought to the doorstep of Frank Walker (George Clooney), an inventor of a mysterious background, who encounters an alternate world with Casey which directly influences their own. I have a lot to say on this one, both positive and negative, so let's get the good stuff out of the way. 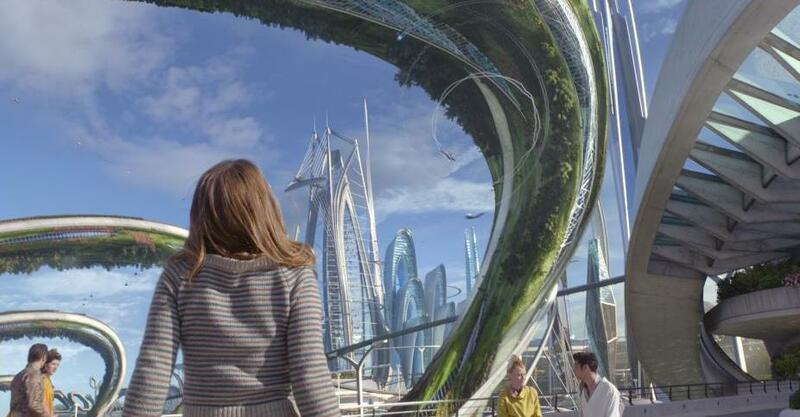 On a visual scale, Tomorrowland is basically flawless - the design of the eponymous city and it's subtle nods to the Disneyland namesake is absolutely stunning, and the concept behind it's existence is both ambitious and original. Nothing is truly silly nor overly dark - the film maintains tension during scenes that demand it, but this is nicely blended with an overall loveable tone. The acting is universally brilliant, not just from Britt Robertson and George Clooney, but also from talented youngsters Thomas Robinson and Raffey Cassidy. So, if Tomorrowland has a potentially engaging narrative, gorgeous visuals, and a superb cast, what could be it's achilles heel? This seems to be a general consensus amongst most critics, and for me it was equally evident - conceptually, the story is genius, but practically, it's an absolute mess. The script, thoughtful as it is, blasts along full steam ahead with little to no definitive explanation provided at crucial moments. More often than not, I sat there amused yet confused, and whilst the beautiful visuals and delightful humour provide some enjoyment, the story lacks any sort of focus or balance. I can just imagine director Brad Bird pitching his story to me, talking at light speed and cutting me off whenever I try to interject and request some extra details. That is exactly how it feels; Tomorrowland simply has no respect for the solidity of it's own narrative or the needs of the audience. It's also a real shame that, when you're already puzzled, the potential for a richer storyline is further wasted when it slowly adopts generic action conventions, mainly the usual set pieces of being chased by armed baddies and exploring all sorts of contrived conspiracies. It's definitely not the film I expected from such an exceptional premise, which is squandered on an underwritten script that shrugs off the need to explain any of it's key events.